Time is running out! The National Genealogical Society exclusive offer for members, friends, and family—50% off the ultimate subscription to MyHeritage—ends Sunday, 21 April 2019. MyHeritage is an industry-leading platform that makes family history research easy and offers you some of the most advanced tools on the market to overcome genealogical brick walls. MyHeritage search and matching technologies enable you to grow your family tree effortlessly and make fascinating discoveries about your ancestors. Hurry! For a limited time, every NGS member can get a one-year Complete subscription for 50% off. Grab this deal before it’s gone! 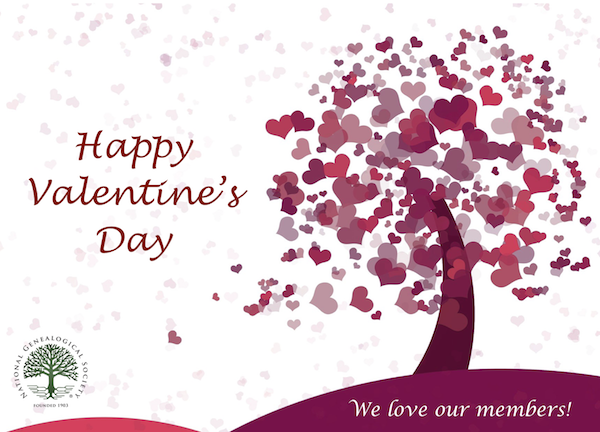 Your purchase can help advance your family history and help NGS too. MyHeritage makes a donation to our society for every new subscription purchased. *Offer valid for NEW MyHeritage subscribers only, valid through 4/21/2019. 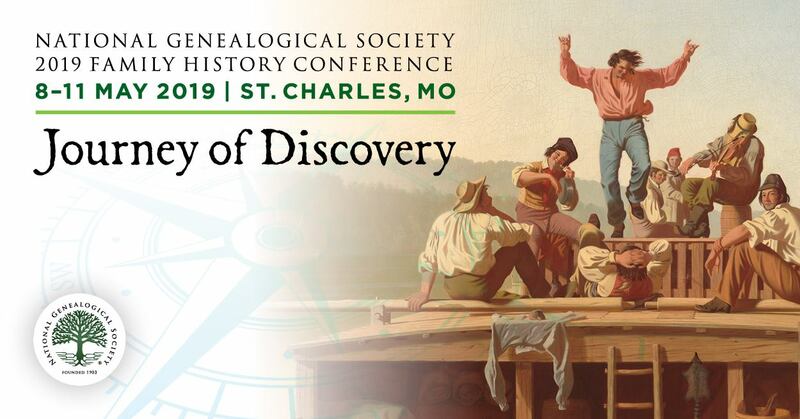 There are only a few days are left to pre-register online for the NGS Family History Conference in St. Charles, Missouri, 8‒11 May 2019. Pre-conference registration ends 19 April. On-site registration and check-in will be available beginning at 12:00 noon, 7 May, in the St. Charles Convention Center. For conference information and to register, go to https://conference.ngsgenealogy.org/register/http://conference.ngsgenealogy.org/event-registration/. Registration for all social meal events and pre-conference tours also closes on 19 April. Ticket purchases will not be available on-site at the conference for social meal events, workshops, or tours. Only a few spots remain for the St. Louis Research Trip and the Civil War Museum Tour. Seats are still available for meal events including the Friends of the Missouri State Archives lunch, the GSG-ISFHWE co-sponsored lunch, and the NGS lunch. There are also seats available in the pre-conference African American Seminar and the Librarians’ Day event. Be sure to make your reservations now at https://conference.ngsgenealogy.org/register/. To add meals, tours, and pre-conference events to your current registration, log on to the NGS website, click on Store>My Account>Select View next to 2019 Conference>Select View Again>Select Add Sessions. The conference, “Journey of Discovery,” will showcase more than 150 lectures featuring a variety of tracks and topics including ethnicity, genetics, immigration and migration, military, Missouri, religion, technology, and more. The program will include all levels of genealogical skills from basic to advanced, as well as four days of the Board for the Certification of Genealogists® (BCG) Skillbuilding lectures. The DNA track will feature eighteen presentations on genetic discoveries, science, and methodology. The Family History Expo will feature more than seventy-five exhibitors and be open to the public Wednesday through Saturday. Check the website for a list of exhibitors and the accompanying floor plan. You do not want to miss this year’s exciting conference program. Register today! Hope to see you soon in St. Charles! Whether you plan to go to the NGS Conference or not, you may want to take a look at our free NGS Conference App. The Mobile Conference App for the National Genealogical Society (NGS) 2019 Family History Conference is now available. With thousands of family historians and genealogists attending more than 150 lectures, special programs, luncheons with guest speakers, and an expansive Family History Expo, the NGS Conference App will enable you to stay organized and on top of the latest information. 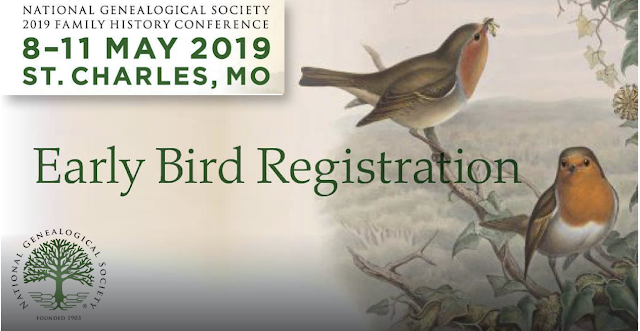 If you have not yet registered for the conference, which is being held in St. Charles, Missouri, 8‒11 May 2019, visit https://conference.ngsgenealogy.org/register/. If you cannot attend, the app is a good way to take a look at the fantastic program NGS has prepared and you can order our video or audio recordings from the PlaybackNGS website. The free NGS Conference App is available for iOS, Android, Blackberry, Windows Phone, and web-enabled devices. Go to the NGS Conference website to download the app or search your app store for NGS Family. scroll down and tap download. If you have already registered, we encourage you to begin using the app now so you can improve your conference experience in St. Charles. If you haven’t registered, we invite you to discover all the NGS 2019 Family History Conference has to offer. Online registration closes 19 April 2019. The National Genealogical Society is excited to share an exclusive offer for members, friends, and family: 50% off the ultimate subscription to MyHeritage, valid through 21 April 2019. 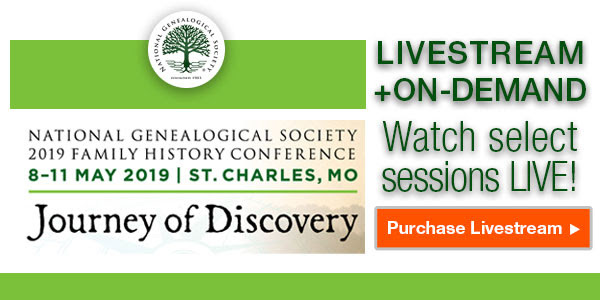 The National Genealogical Society will live stream ten lectures by nationally recognized speakers on some of the most popular topics in the field of genealogy during its 2019 Family History Conference. These lectures will be among more than 135 offered at the conference, 8−11 May 2019, in St. Charles, Missouri. On 9 May, three live stream lectures will focus on DNA’s role in supplementing genealogical research. Also on 9 May, two other talks will discuss ethnic research. The five selections on 10 May feature lectures by the Board for Certification of Genealogists (BCG) that emphasize research, analysis, and problem-solving skills. NGS members and non-members across the United States and overseas, who are unable to attend the conference in person, are invited to sign-up for these live stream broadcasts. Friday, 10 May 2019: Five BCG Skillbuilding lectures will be live streamed from 8:00 a.m. Please consider joining us in person or by live stream starting 9 May. And you can also check back and order recordings from the 2019 conference at the PlaybackNGS Website. Please don’t miss this opportunity! Time is running out for family historians to receive a discount on registration for the National Genealogical Society (NGS) Family History Conference in St. Charles, Missouri, 8−11 May 2019. After 19 March, the price of registration for NGS members will increase from $215 to $250 for all four days. Non-members will pay $285, up from $250. Genealogists will also no longer be able to order a printed syllabus or flash drive version of the syllabus. To qualify for the early bird discount, you must register online by 19 March or mail your registration postmarked 19 March. The conference, “Journey of Discovery,” will showcase more than 150 lectures featuring a variety of tracks and topics including ethnicity, genetics, immigration and migration, military, Missouri, religion, technology, and more. The program will include all levels of genealogical skills from basic to advanced, as well as four days of the Board for the Certification of Genealogists® (BCG) Skillbuilding lectures. The DNA track will feature eighteen presentations on DNA discoveries, science, and methodology. The Family History Expo will feature more than seventy-five exhibitors and be open to the public Wednesday through Saturday. Check the website for a list of exhibitors and the accompanying floor plan. The NGS Conference will be held at the St. Charles Convention Center and will run from 8−11 May. For conference information and to register, go to the NGS 2019 Family History Conference website. Registration for local area tours and social meal events closes on 19 April 2019. You will not be able to purchase tickets on-site at the conference. Be sure to sign up as quickly as possible. To add meals, tours, and pre-conference events to your current registration, log on to the NGS website, click on Store>My Account>Select View next to 2019 Conference>Select View Again>Select Add Sessions. See you in St. Charles in May! Time is running out for speakers—as well as organizations interested in sponsoring lectures—to submit lecture proposals for the National Genealogical Society 2020 Family History Conference, Echoes of Our Ancestors, which will be held in Salt Lake City, Utah, 20‒23 May 2020. All proposals must be submitted electronically at https://www.ngsgenealogy.org/call-for-proposals/ by 11:59 p.m. EDT on 1 April 2019. NGS also requests proposals that include the integration of DNA and technology into family history research as well as methodology and problem solving. NGS encourages proposals that demonstrate methods to help genealogists accurately identify ancestors through reasonably exhaustive research, proper source citations, analysis and correlation, resolution of conflicts, and sound reasoning and coherent writing. Speakers who wish to submit lecture proposals may submit up to eight proposals electronically. The speaker compensation is described in detail on the website. Visit the website for details about required speaker information and each submitted proposal. NGS has a free webinar, Becoming a Better Conference Speaker: Proposals and Preparations, which can be found on the National Genealogical Society YouTube channel that can help you prepare your proposal. If your genealogical organization would like to sponsor a lecture, submit proposals to NGS. If your organization would like to sponsor a luncheon, please contact [email protected]. Do not use the sponsored lecture form.